camera (Moeez for Maybelline New York) Lead makeup artist for Maybelline New York, Grace Lee, breaks down how she survives New York fashion week. If you think New York Fashion Week is a lot of glitz and glam, you're right. However, the part that many of us don't see is the team working behind-the-scenes -- almost as makeup magicians -- to make sure model faces and designer needs are all on point. One person who comes to mind when it comes to backstage beauty is the lead makeup artist for Maybelline New York, Grace Lee. She is far from a rookie and more like an artist-in-chief at creating some of Fashion Week's coolest makeup looks. 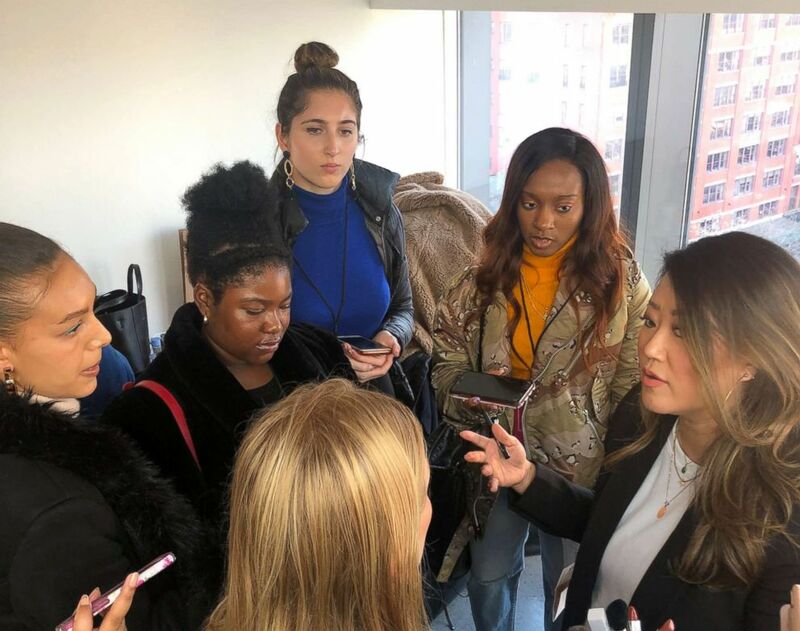 (Maybelline New York) Grace Lee explaining the makeup behind Cushnie's fall 2019 show with press. Lee's creative makeup visions have been executed all across the globe at shows for Rebecca Minkoff, Public School, Cushnie, Nanette Lepore and more. When "GMA" received the opportunity to learn more about how Lee survives Fashion Week with such grace, we couldn't help ourselves, and had to learn all her tips and tricks for not only doing it well but doing it like a true boss. As a working mother of two children, prepping for NYFW isn't just five minutes of meditation for Lee. She actually begins mentally and physically preparing the week before. "I try to get as much sleep as possible so I don't come to New York thinking am I going to party during fashion week," says Lee. "I have the mindset like I'm gonna work, so I try to eat well, sleep as much as I can, but really it's like preparing for the Olympics for me. I have to get as healthy as possible!" Lee also points out that prior to shows she makes sure to take vitamins and eat well. 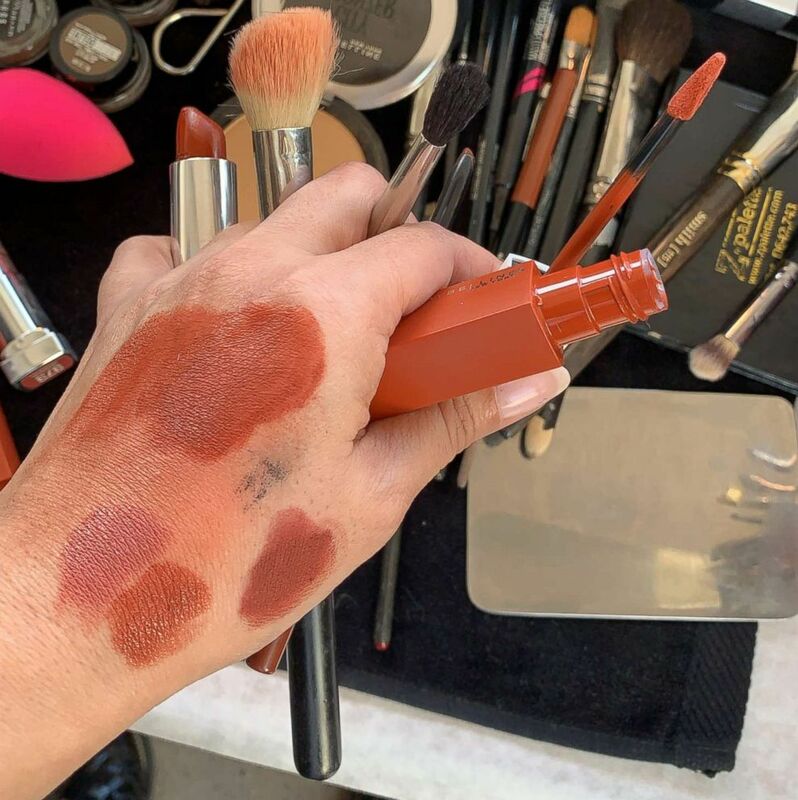 (Maybelline New York) Grace Lee swatches products backstage before Cushnie's fall 2019 show. Normally, Fashion Week makeup artists usually have to meet with designers prior to the show dates to test the makeup looks along with the new collections and make any necessary adjustments as needed. "So, I swear, I pressed snooze and I didn't wake up right away," Lee said of her challenging morning. "Like, I woke up half an hour later than I was supposed to and then I was off to the Rebecca Minkoff test." With so much going during Fashion Week, makeup artists rarely have hours to prep their own looks, but somehow, Lee's makeup is always flawless. "A good foundation is key, and you want one that's going to last you all day. Think longevity products like waterproof mascara. I also personally love Maybelline's SuperStay Matte Ink Lip Color lipsticks because you literally can apply it in the morning and they will last you even throughout a party or through the night," she said. When it comes to getting models ready quickly, Lee points out that using products in more ways than one is helpful. For example, using your blush on your cheeks, lips and eyes can save time. (Andrew Day for Maybelline New York) Grace Lee applying makeup on a model backstage at Rebecca Minkoff. Inspired by the rich tones in the Cushnie's Fall/Winter 2019 collection, Lee created a monochromatic terracotta look on eyes, cheeks and lips to mimic the aesthetic of the collection. To start with a radiant even base, a foundation was applied to the face along with concealer where needed, along with a mix of mauve-toned lipsticks to the lids, lips and cheeks. Then she created a "cool girl cat-eye" by using a gel pencil liner to trace, starting from the center of the eyelid and bringing it out to the outer corners of the eyes in a wing shape. Brows were enhanced with pomade to enhance arches and set with clear mascara. To finish the look, lips were shaped with a brown-toned lip liner and filled in completely with a mix of bronzed terracotta colored lipsticks. 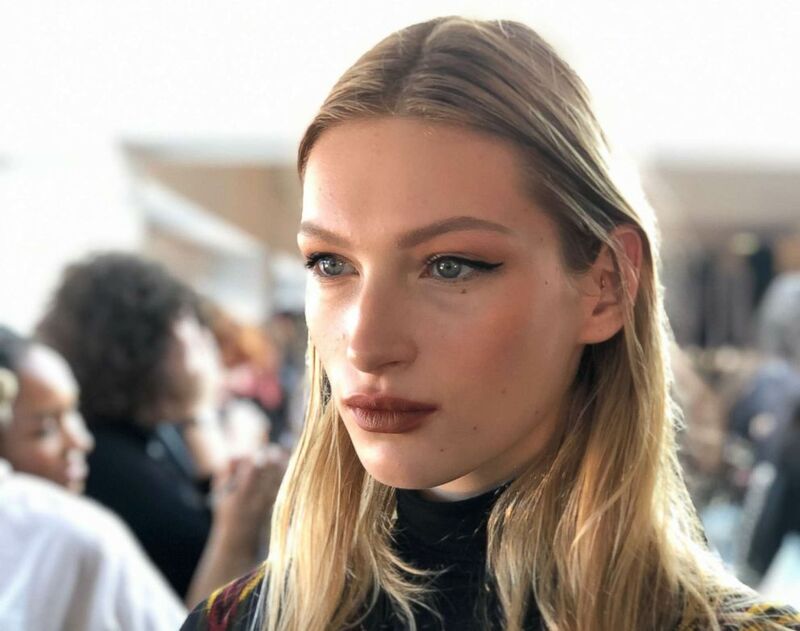 (Maybelline New York) A model strikes a pose backstage before Cushnie's fall 2019 show. While leading the charge backstage, Lee says, "It's so hot in here! I feel like I'm gonna sweat my face off." She continued, "It's like 500 people pulling at you all at once, but I have two kids so I understand how to multitask." While there's lots of preparation leading up to the show and even minutes backstage right before the show, Lee said that it's all worth it. "It's amazing to see the production of it all. I like having my team, and then my favorite part is literally at the end when you see the finale of the makeup, of the models, come through, and then everyone's clapping and the designers are happy. That, to me, kind of pays off in the end," she said. 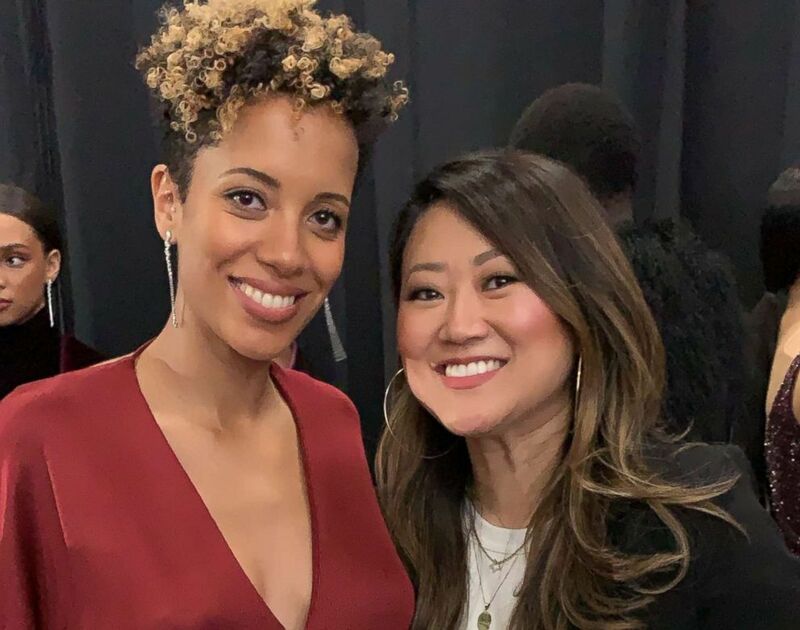 (Maybelline New York) Grace Lee posing with designer Carly Cushnie after the fall 2019 Cushnie show.